Don't Fear (Game Design) Change! I wanted to address something I've seen quite a bit in the short time I've been in the games industry, something that seems to cause games to fail, and something that can be relatively easily prevented. Don't fear change in your game design. I mean, ideally, don't fear change at all, but today I want to talk about games. 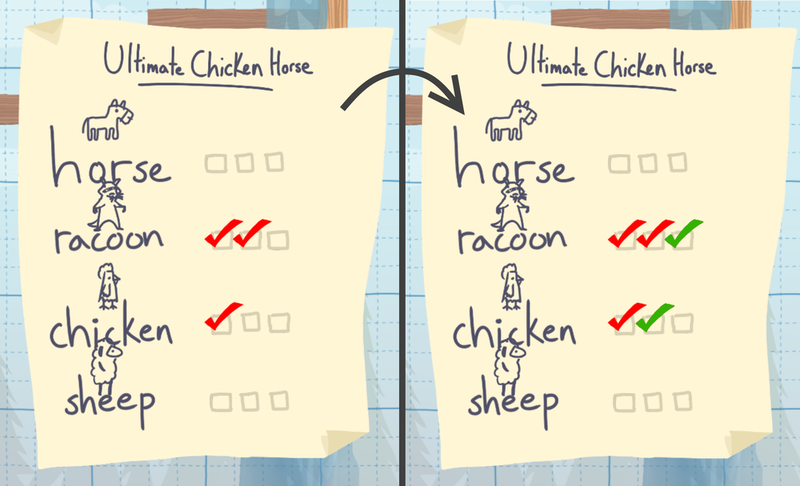 I'm going to jump right into the example I know best, the scoring system which we redesigned in Ultimate Chicken Horse to address a pretty serious problem we had been seeing since the early days of development. What this meant was that there was no way to catch up, and the last place person wanted to end the game quickly so that it could finish, as they knew they couldn't overcome their deficit. Realistically, people enjoyed playing and didn't sabotage the game, but this kind of issue could be the difference between a game you want to play for a few hours or for a hundred. Our solution was to change our scoring system completely, with 4 months to go before release. Crazy, right?? Not so much. The new scoring system works such that points are awarded differently, and more points are awarded for things like coming in first place, placing a trap that killed someone, etc. We also added a "comeback" where a player can get bonus points if they've been losing a lot and finally make it to the end. This acts as a sort of handicap, similar to giving the last player in Mariokart a lightning bolt. Unfinished art, but new scoring system! The result, from what we've seen so far, has been overwhelmingly positive. Just from us (the devs) playing the game, we've noticed that it's a lot more interesting to see the results after each round, and especially exciting when you get bonus points which put you just above the next player. Even in last place, you feel like you can catch up in almost every situation. The lesson to be learned is that even late in the game, it's worth it to make informed and careful decisions even if they may greatly affect the gameplay. There are other examples of drastic changes to design which worked out well in the end. One of these examples is Antichamber, formerly known as Hazard. The game started out as a type of 3D snake meets Asteroids (as described by some), and ended up being an Escher-esque puzzle game, which is freaking awesome. What I wanted to talk about though was the name change. Alex Bruce, the creator of Antichamber, had received great feedback on the game but many people, including Jonathan Blow and Jamie Cheng, all disliked the name. The game had already won awards and you can be sure it was his "baby" by this point... yet he pulled through and changed the name of the game. Rebuilding the brand was no easy task, but he was happier for the change in the end and I think the sales numbers reflect that it was a good decision. Race N Chase, which was a cops and robbers game where you played as a police officer, eventually evolved to become GTA, where you play as the criminal. Goldeneye for N64 actually started its development as an on-rails shooter game until about halfway through development, before becoming the iconic FPS that helped to define a (my) generation. The conclusion to all this is that sometimes, even though your game is your baby, it makes sense to change things up. Even if it's late in production. Even if they're major changes. I must say though, it's very important to think critically about feedback you're getting... we've had some ideas that are absolutely unfeasible or outright ridiculous come from people who are well informed and have experience in the game industry. We've also had really great ideas, which have helped us and made the game infinitely better than it was early on in production. So, be careful, but don't fear change! New Website and New Lobby!